I have been working with a client that has been trying to tackle an ongoing problem of poor behaviour and code of conduct breaches in the workplace. Examples of bullying and harassment are a reasonably common occurrence and appear to have been tolerated over a number of years. On my most recent client visit, I learned that a newly promoted leader of a major site had terminated a number of individuals who were responsible for the code of conduct breaches. Their behaviours had come to the leader�s attention at the time of his promotion. He had subsequently investigated the situation, presented the facts to his team leaders and taken swift corrective action. This leader displayed courageous leadership. The new leader in this example decided that the status quo was not acceptable. He was not willing to let the behaviour continue on his watch, even when Head Office questioned his decision to terminate the employees responsible in order to take a more safe and cautious approach. To the outsider, the decision to terminate employees may appear easy and necessary, but within an organisation there are many impediments, management included, for taking such a course of action. Courageous decisions are not easy and the leaders who take them will often be faced by doubts and second-guesses. However, the ability to hold firm and �step into� such an important decision is one that we should aspire to realise in all of our leaders. Newsletter Reader Question: I am a consultant who goes into a lot of organisations to facilitate group workshops. I sometimes find it extremely difficult to encourage certain people to speak up during these workshops. Do you have any tips or advice that you could share from your experience? I want to preface my answer with a couple of quick thoughts on participation in a group setting. It is always important to keep in mind that people are either naturally extroverts or introverts, or somewhere in between. If you find yourself in a roomful of introverts this can certainly present a tricky scenario! Also, whenever we present to a group we must pay heed to the significant power of culture. Different cultures are more comfortable participating in a group situation than others, and this will depend on a raft of factors including language barriers, personal characteristics of individualism or collectivism, or a preference for hierarchy relationships. Having said that, I find the idea of psychological safety is a very important concept to explore in any group facilitation. We are all well aware of the concept of physical safety and the ability to stay physically safe in the workplace. I am sure you discuss fire exits and any other necessary precautions at the start of each workshop. However, do you discuss psychological safety? In a group setting, we all need space to say what we want to say without experiencing any repercussions or retribution. This is not a given in all organisations; it is not implicit when we start facilitating a discussion. Many consultants, including myself, use the concept of �Chatham House� rules � where what is said in the room stays in the room � to help create this requisite safe space. I also find it extremely valuable to establish the rules of engagement at the beginning of each session I run. I ask the group members to provide input and express how they expect the session to be run. This allows me an opportunity to gauge the dynamics of the group and ultimately obtain a commitment from my participants that our time together will value speaking up openly, listening to reflect, and embracing vulnerability. You will never get all of your participants to provide equal input into any workshop, but if you can establish a strong sense of psychological safety your time together will certainly be more effective. How do we hold people accountable for their actions? The first and most important step is to define and establish what accountability is. In their book, Patterson et al. explore this concept and explain the practical ways to hold people accountable in a variety of workplace and organisational settings. Crucial Accountability is an important resource for professionals throughout an organisation. A lack of accountability can lead to broken promises, missed deadlines and poor behaviour; which in turn will often lead to significant declines in organisational performance and output. 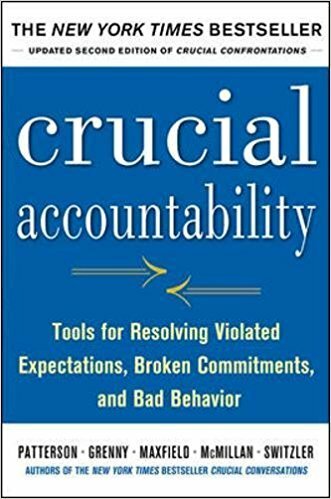 Drawing from 10,000 hours of observations, Crucial Accountability teaches you how to deal with common infractions and violated expectations in a way that solves the issues at hand without harming the existing relationships. The book also offers the prerequisite tools and strategies for improving relationships in the workplace, permanently. Holding people accountable is a vital concept for all areas of life. As such, many of the examples, tools and strategies contained in the book are also applicable to relationships in a home setting, and to life in general.